Our Aviation Technology program leads the way in training the next generation of technicians. Who is more skilled – the brain surgeon or the automotive technician? I posed this question at the beginning of my recent presentation to the Arizona House of Representatives’ Education Committee. My topic was “Preparing for the Future of Work and Learning: The Role of Community Colleges.” The query actually was meant to illuminate the point of my talk: Transformative change is taking place in every occupation, and will profoundly affect all workers, from those who wield a scalpel to those who turn a wrench. Behind the disruption are the dizzying advances being made in mobile technology, cloud computing, artificial intelligence (AI) and the Internet of Things. It would not be a stretch to think of these forces as “superpowers” in that, in the words of Pat Gelsinger, Chief Executive Officer of VMWare, a global firm specializing in digital infrastructure, they are on a par with “major nations, shaping the course of history.” Taken together, these forces amount to a Fourth Industrial Revolution that is “fusing the physical, digital and biological worlds, impacting all disciplines, economies and industries, and even challenging ideas about what it means to be human,” according to Klaus Schwab, Klaus Schwab, founder and executive chairman of the World Economic Forum. These forces will have a profound impact on work. The World Economic Forum estimates that 65 percent of today’s first graders will work in jobs that do not currently exist. And the timeframe for these seismic shifts are a little more than a decade away. In some cases, the shifts have already occurred. By 2030, 1 in 3 U.S. workers – including the surgeon and the mechanic — will need to learn new skills and find work in new occupations, according to a 2017 McKinsey Global Insights forecast. What does this mean for Pima Community College, a large comprehensive higher education institution in Tucson, Arizona, about 65 miles from the Mexico border? Pima and its fellow Arizona community colleges, uniquely positioned to provide the human capital that helps determine the economic success of our region, must possess the nimbleness to train Arizonans to thrive in the brutally competitive global marketplace of the 21st century. There is no time to waste: The Brookings Institution calculates that 44 percent of job tasks in Tucson and Phoenix already are susceptible to automation. “Shift Happens 2,” a February 2019 report by INNOVATE + EDUCATE, a national workforce development nonprofit, stresses the importance of learners pursing a myriad of credentials. “Today, it is no longer a pathway from primary to secondary to postsecondary education leading to a job. That staid formula is no longer working . . . . Today, a learner’s most pressing need is a greater connect between education and employment outcomes.” Pima recognizes the need to shift teaching and learning to emphasize applied learning, lifelong learning and earn-to-learn models. The success of these endeavors depends on strong partnerships with business. For example, through our Applied Technology Academy, we are training engineers from Caterpillar, the global heavy-equipment manufacturer, which recently opened a facility in Tucson. Caterpillar has identified a gap in its engineers’ skill set: they lack real-world, factory-floor fabrication experience. Pima’s remedy is to offer six-week lab-lecture classes, Welding for Non-Welders and Machining for Non-Machinists, that lets the engineers get their hands dirty. So far, 48 CAT employees have completed the classes, and another cohort is scheduled. We also are developing a new class, Prototyping using Non-metal Materials. Meeting the needs of industry is also the goal of our collaboration with TuSimple, an autonomous vehicle manufacturer with a production facility in Tucson. With autonomous trucks delivering groceries in Phoenix, it’s clear that the future of truck transportation will mean drivers will need to learn a special set of new skills. We are working with TuSimple to build an Autonomous Vehicle Driver and Operations Specialist certificate that will build competencies in multiple areas – from logistics to information technology to automated industrial technology – that will be needed for the drivers of the future to interact with their autonomous vehicles. A Center of Excellence (CoE) is an academic hub, a collection of programs strategically aligned to pursue excellence in a particular field of study. Pima is planning CoEs in six disciplines; the first to be brought online will be one focused on Applied Technology. We are investing more than $56 million, with additional funding to come from a capital campaign, to expand existing programs and start new ones across three areas: Transportation Technology (e.g., Automotive Technology, Diesel Technology, Autonomous and Connected Vehicles), Manufacturing/Advanced Manufacturing (Machine Technology, Welding/Fabrication, Automated Industrial Technology, Process Control Optics, Quality and Design), and Infrastructure (Construction, Utility Technology, Mining and HVAC). Our CoEs are founded on meeting the workforce needs of today while forecasting and responding to changes beyond the horizon. Everyone benefits when education and private industry collaborate. In Arizona, we are fortunate to have leaders who recognize the role government can play in propelling the state’s economy. Gov. Doug Ducey has included in his 2019 budget proposal a $20 million one-time allocation to expand and improve our Aviation Technology Center (ATC). If approved by the State Legislature, the funding will potentially double, to 250, the students the ATC can serve. The extra capacity is necessary, as the program currently has a waitlist stretching more than a year. 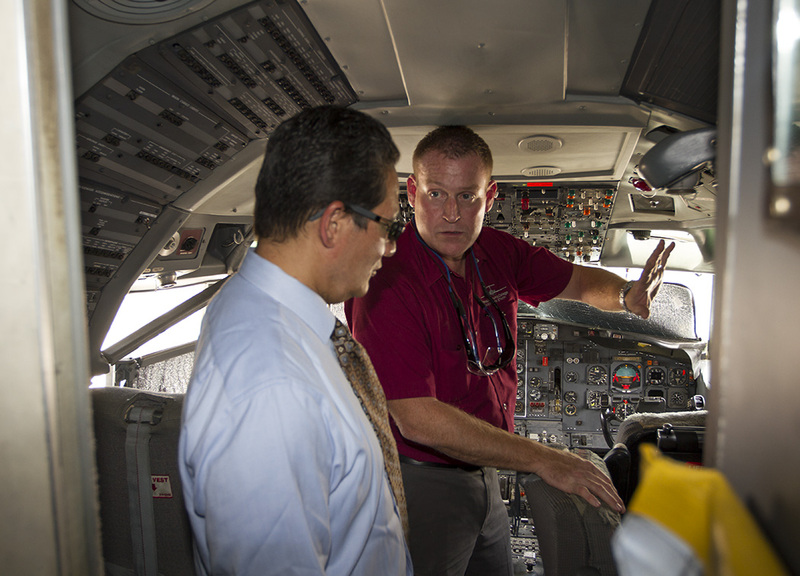 Why Pima’s Aviation Tech Center? Our ATC has a national reputation built on rigor – 2,000 hours of training, more than 100 exams, nearly 300 hands-on projects. We are one of a handful of schools offering sought-after advanced structural repair and modification, and commercial jet transport and Avionics training, thanks to the 727 on site. The state’s investment in Pima would solidify Arizona’s pre-eminent position in aerospace manufacturing while helping fill an education gap that could threaten our lofty standing. Arizona ranks No. 1 in overall aerospace manufacturing, according to the global consulting firm PricewaterhouseCoopers (PwC), but is only 20th in the U.S. in the education subcomponent of the rankings. PwC notes that our northern neighbor Utah has engaged seven aerospace companies in the expansion of a program that provides high school seniors with training for an aerospace manufacturing certification. It is imperative Arizona does not fall behind in providing the “educated, technology-savvy and diversified workforce” needed to maintain competitiveness in this sector. The bottom line, according to an analysis by Sun Corridor Inc., a regional economic development entity: The expansion would produce 75 new Aviation Tech graduates a year in jobs with an average salary of $52,000. The total economic impact from 2019-2023 from the $20 million investment: $225.6 million – a better than 11-to-1 return. In aviation, as in other economic sectors, one need not be a brain surgeon to recognize the wisdom of preparing our workforce for the future. This entry was posted in Uncategorized and tagged 4IR, Aviation Technology, Aviation Technology Center, Caterpillar, Doug Ducey, economic development, Fourth Industrial Revolution, Klaus Schwab, ThingsThatMatter, TuSimple, workforce development, World Economic Forum on March 6, 2019 by pimachancellor. I am pleased to give you good news on the status of our Aviation Technology Center (ATC). You will recall that when a college offers more than 50 percent of courses for a specific program at a location geographically separate from a main campus, the Higher Learning Commission (HLC) must approve the site. Further, colleges are prohibited by the U.S. Department of Education (ED) from disbursing federal financial aid for programs at sites that have not been HLC-approved. We discovered that PCC had never obtained this approval for the ATC site, and self-disclosed this fact to the HLC and ED. We immediately filed for approval with the HLC, and did not disburse financial aid to Aviation students for the summer semester. Instead, the College and the PCC Foundation provided affected students with institutional and Foundation scholarships. I want to emphasize that through this whole process the Aviation program itself has remained fully accredited and approved by the Federal Aviation Administration (FAA) and the HLC. On June 27, 2016, the HLC approved the ATC at Pima Community College as an additional location. This means that the College is able to offer the various Aviation degrees and certificates at the ATC. This approval also allowed the College to seek approval from ED to offer federal financial aid at this location. We are awaiting final approval from ED, but based on our conversations with them, we are optimistic that this will occur before the fall financial aid disbursement date of September 9. We also have learned that the Department is in the process of reviewing our Program Participation Agreement (PPA) and updating our Eligibility & Certification Approval Report (ECAR), which contains the ED list of Pima’s approved locations. These are very positive signs. On Thursday, August 4, 2016, Aviation leadership met with students, updated them on our progress, and discussed the College’s efforts to ensure that financial aid students remain unaffected. The College is working to have contingency plans in place, should the ED approval be delayed past September 9. I am encouraged by these developments, and I am proud of the staff and faculty who proactively identified this issue, and have been working to correct it. Thanks to their efforts, this is one more example of the College’s progress toward becoming a premier institution of learning. This entry was posted in Uncategorized and tagged Accountability, accreditation, Aviation Technology Center, Department of Education, Higher Learning Commission on August 5, 2016 by pimachancellor. I have good news to share about our Aviation Technology Center (ATC). The College was notified today that the Higher Learning Commission has approved the ATC as an instructional site. If you’ll remember, when a college offers more than 50 percent of program instruction at a location geographically separate from a main campus (in ATC’s case, Desert Vista), the HLC must approve the site. Today, I received a letter from HLC President Barbara Gellman-Danley notifying the College that the Institutional Actions Council of the HLC on June 27 approved our request “to open three additional locations”: the ATC, 7211 S. Park Ave.; Maintenance and Security, 6680 S. Country Club Road; and the Tucson Public Safety Academy, at 10001 S. Wilmot Road. The letter added that the HLC, per policy, will conduct a required Additional Location Confirmation Visit to the ATC within six months. Additionally, the HLC approved PCC’s request to open additional locations at the Arizona State Prison Complex-Tucson, 10000 S. Wilmot Road, and the Federal Bureau of Prisons’ Federal Correctional Complex at 8901 S. Wilmot Road. It should be noted that the College, while seeking HLC approval of the ATC, self-disclosed its status to the U.S. Department of Education. The DOE is conducting a focused program review of the ATC. DOE’s review potentially affects the College’s ability to disburse financial aid at the ATC because institutions must first receive approval from their regional accrediting body, i.e. the HLC, prior to disbursing federal financial aid. We are working with the DOE to seek approval to disburse financial aid to ATC students for the Fall 2016 semester. Today’s good news represents crucial progress for the College in the areas of compliance and accountability. We continue to improve our alignment with accreditor and regulator standards and expectations. The beneficiaries are our students, who can attain their goals through a Pima Community College education. Thank you for your dedication to doing things right, and enjoy the holiday. This entry was posted in Uncategorized and tagged accreditation, Aviation Technology Center, Department of Education, Higher Learning Commission on July 4, 2016 by pimachancellor. I have good news to share about our Aviation Technology Center (ATC). The College was notified on May 17 that the Higher Learning Commission’s Review Committee has recommended approval of the ATC as an additional location, and this will be voted on at the HLC’s June 26 & 27 meeting. Wednesday, Desert Vista Campus Vice President Ted Roush notified Aviation students of the HLC’s recommendation, which eliminates the need to move classes from the ATC to other PCC locations. The students also were updated that the College still is waiting for the Department of Education to approve disbursement of financial aid to students taking courses at the ATC. The College has been reaching out to Summer 2016 Financial Aid-certified students at the ATC to inform them that their tuition and other expenses that would have been funded with federal financial aid will be paid instead with institutional and private funds. Each student’s financial situation is unique; aviation academic advisors, counselors and financial aid staff are working with Financial Aid-certified students individually to make sure there is a clear understanding of the process. But it’s important to reiterate: all eligible financial aid Aviation students will be held harmless for the summer. Bringing the Aviation Technology Center into compliance with HLC and Department of Education rules is crucial to ensuring the success of our students in the highly regarded Aviation program. It also serves as an example of the importance of transparency and accountability amid the complexity of higher education regulation. All across the College, employees are working to bring us into compliance with accreditors and regulators so that students can reap the benefits of a PCC education. I thank you for your dedication to doing things right. View a fact sheet, for more information regarding the Aviation site approval process. This entry was posted in Uncategorized and tagged Accountability, accreditation, Aviation Technology Center, Department of Education, Higher Learning Commission, transparency on May 22, 2016 by pimachancellor. 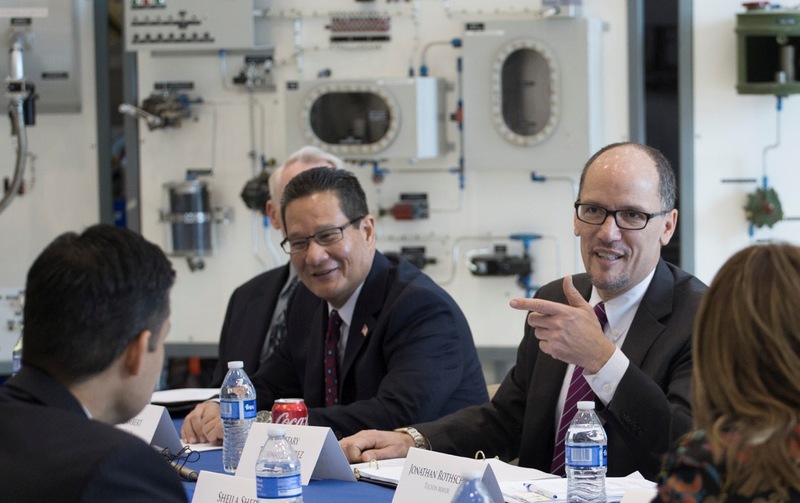 Pima Community College was honored to host a visit Jan. 29 by Secretary of Labor Tom Perez. Secretary Perez joined me, Tucson Mayor Jonathan Rothschild, Tucson Unified School District Superintendent H.T. Sanchez, PCC Board Chair Sylvia Lee and other PCC leaders on a tour of our Aviation Technology Center (ATC). Secretary Perez also attended an event at our Downtown Campus regarding health insurance options under the Affordable Care Act. During the visit to the ATC, Secretary Perez learned about initiatives PCC is undertaking through Trade Adjustment Assistance Community College and Career Training (TAACCCT), which is administered by the Labor Department. In September 2014, PCC received a $2,499,997 grant under the fourth round of TAACCCT, which enables community colleges to work with industry to develop training and education programs that will lead to high skill-high paying jobs. As part of the grant, PCC is partnering with business to develop a degree pathway in Industrial Technology that includes four short-term certificates. PCC also is adding short-term options to existing degree programs in Welding and Aviation. At ATC, Secretary Perez attended a roundtable discussion with a cross-section of government, education, industry and workforce leaders. The takeaway from the meeting was clear: Community stakeholders need to coordinate their efforts to advance Career and Technical Education (CTE) as a ticket to the middle class, and that investments such as those made through TAACCCT make a difference. Mayor Rothschild noted that women, minorities and military veterans are among the populations that could make great use of this valuable education. 43 percent of young workers with licenses and certificates earn more than those with an associate degree, 27 percent of young workers with licenses and certificates earn more than those with a bachelor’s degree, and 31 percent of young workers with associate degrees earn more than those with a bachelor’s degree. I pointed out the need for a state and federal governmental framework that offers flexibility in student aid and allows educators to offer industry-driven programs that keep up with oft-dizzying pace of technological change. Secretary Perez and the group did hear from a veteran, Ashley Rodriguez, who served as a Marine in Iraq before graduating from the Aviation Technology program and getting a job with Bombardier in Tucson. Rodriguez forthrightly described the roadblocks she had to overcome to go from the military to PCC and her new career. Secretary Perez summed up what we at PCC know about Ashley – “You’ve got game,” the secretary said – and said he would seek to find ways to straighten the pathway to civilian training that veterans must often travel. Many employees made Secretary Perez’s visit to the ATC a success. Tom Hinman, Advanced Program Manager at the ATC, led an informative tour that included stops at the center’s two 727s. [PCC is one of the few U.S. programs with hands-on training on commercial and regional jets.] Tom’s team did a first-rate job with the logistics of a multifaceted event. Joanne Kingman, Program Manager in Workforce and Business Development, clearly explained the grant, sharing our best practices and highlighting our partnerships with industry. Dr. Morgan Phillips, who as president of the Desert Vista Campus is responsible for the ATC, moderated the invigorating discussion. Government Relations Liaison Michael Peel reached out and brought together the community leaders for the valuable sit-down. Secretary Perez has said that community colleges are the “secret sauce” of workforce development. I believe his visit confirmed that PCC’s wise use of the federal government’s investment in Career and Technical Education is improving the lives of individuals and contributing to economic development, and that the recipe for continued success demands that all stakeholders in the community continue to work together. This entry was posted in Uncategorized and tagged Aviation Technology Center, career and technical education, CTE, Labor Secretary Tom Perez, TAACCCT, U.S. Department of Labor, workforce development on January 30, 2015 by pimachancellor. On Monday I had the pleasure of touring our Aviation Technology Center, an impressive facility on the grounds of Tucson International Airport. The ATC includes a huge hangar where students work on just about every type of aircraft, from single-engine Cessnas to Boeing 727s donated by FedEx. It’s the 727s that set our program above the rest. 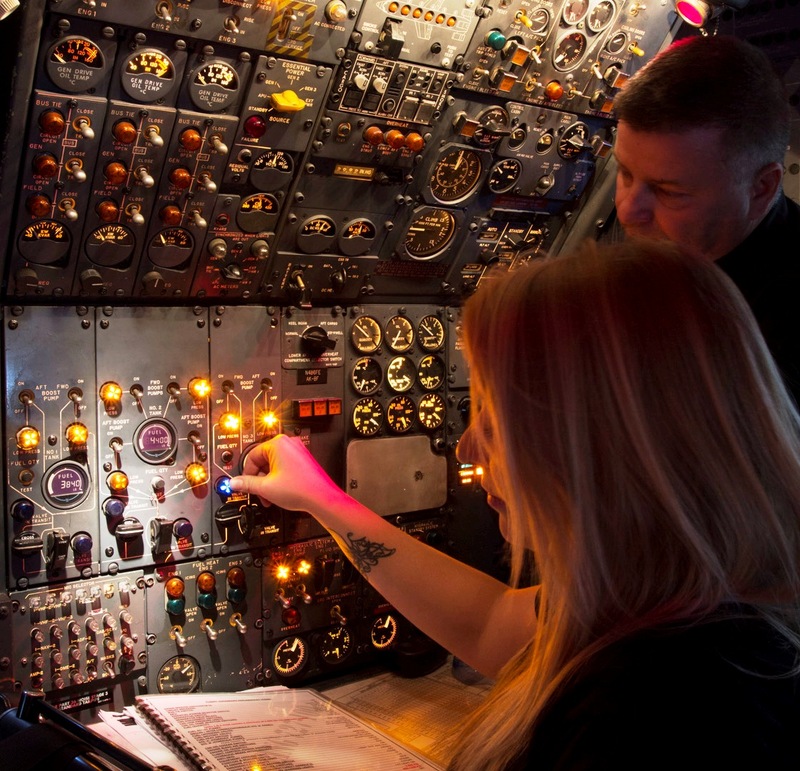 Hundreds of our students have benefited from real-world, hands-on training on the aircraft. They actually do what students in most other training programs only read about. Besides state-of-the-art equipment, the center has supremely capable instructors and staff, and students whose dedication to PCC’s rigorous course of study is founded on the knowledge they can count on high-paying employment in a field where the sky is the limit. Just about all of our graduates have jobs lined up in the Tucson area, contributing to the prosperity and economic development of the region. My thanks to Desert Vista Campus President Johnson Bia; Desert Vista Vice President of Instruction Ted Roush; Aviation Technology Program Manager Tom Hinman; Department Chair Pete Stogsdill; faculty members Bruce Bessette, Dave Raymond and Eric Ross (pictured above); lab specialists Merrill Yeary and John Svob; and program assistant Benetta Jackson. This entry was posted in Uncategorized and tagged 727, aviation, Aviation Technology Center, economic development, FedEx, jobs, training on July 10, 2013 by pimachancellor.